So here's the thing. Whenever I travel, I think about my nails ... because heaven forbid I wear the same color for the entire trip. I'm always making sure to leave room in my quart-size plastic bag for at least 2 or 3 extra colors (plus base and top coats, of course). But now, thanks to the Color Clutch, I can easily tote up to 14 of my favorite shades of the moment wherever and whenever I go! I started seeing some of my fellow nail polish lovers post about Color Clutch on Instagram awhile back and I was immediately intrigued. A case built just for the easy stash, storage and transporting of my nail polish? It was a nail polish lover's dream come true! I have the 14-Bottle Color Clutch in Black, and I'm here to tell you it's basically the most miraculous invention ever. Not only does it allow you to stash, as you can imagine from the name, up to 14 of your polishes, but it also includes a line of white strips down one side where you can swatch the colors in case you forget what's inside or want to see how they look. When you switch out the colors in the case, you just wipe off the nail polish on the strips with nail polish remover and swatch the new ones! I love that you can see all your polishes sitting in the case at a quick glance due to the clear lid. I also love the magnetic closure, which helps keep them safe and secure when the case is placed inside a suitcase. The one issue I have with Color Clutch is that the slots don't fit all nail polish bottles. 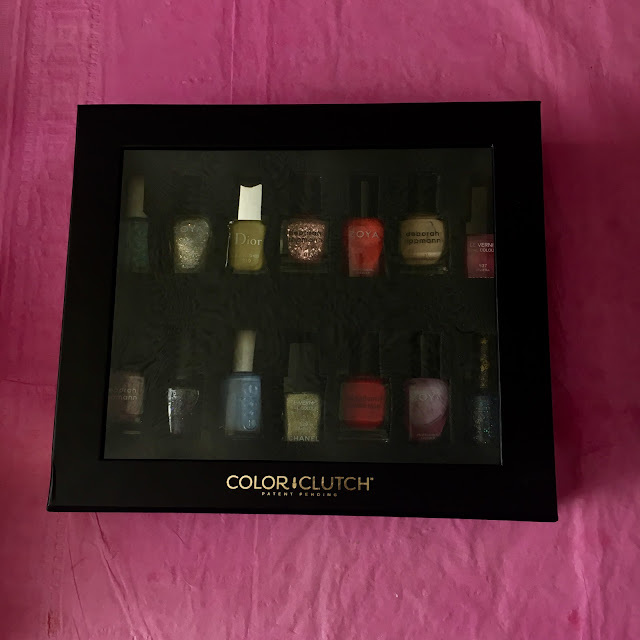 I wasn't able to fit butter LONDON, RGB or Rescue Beauty Lounge bottles, and even my Deborah Lippmann bottles had to be wedged in pretty tightly. But it definitely fits Essie, OPI, Dior, Chanel and other smaller bottles very easily. Color Clutch really is such an ingenious invention. I love that now I can easily carry around so many colors -- it feeds right into my nail polish obsession! The 14-Bottle Color Clutch in Black retails for $19.99 at colorclutch.com. I need about 12 of these beauties! I just got one of these today! <3 I'm super excited about it. Usually I just throw mine into bubble wrap & risk breakage. This is such a brilliant idea! I wish they would make one for lipsticks and one for foundations! So freaking cool! I just got one to review and it was white. I haven't seen a white one yet so I was super excited! I remember seeing and reading about this about a year or more ago and thought it was so fun. I wish they had larger ones or a box that stacks, because I'd get it in a heartbeat.